I think of pralines as something that used to be served for dessert at Tex-Mex restaurants, but now they are so scarce I doubt if there is anybody who has them anymore. To me the sopapillas they serve in many Mexican restaurants are a poor substitute, and is the trigger that usually reminds me that I would really like a praline. 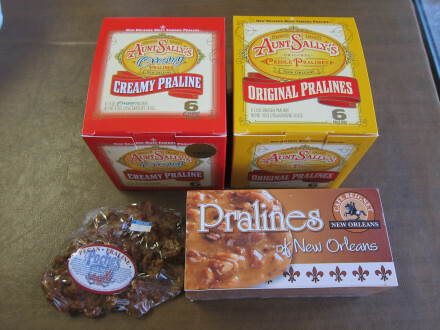 Pralines also seem to be very hard to find anywhere, except in a few places such as Louisiana. Listed below are three places where I found them, but I passed by many more with signs advertising them for sale. With the prices they charge, I think this is a lucrative business for many people. For me, though, they are really worth the price. The top two boxes are from Aunt Sally’s, probably the most famous place in the French Quarter for this candy treat. They offered free samples in the store, and all this did was make me spend more money on ones to take home. The original is the kind of praline I remember from the Mexican restaurants, so naturally I had to have this. I really think, though, that the creamy praline is probably better. It is smooth and gives you more flavor than the almost pure sugar you get from the original variety (both, of course, have pecans inside the candy). Still being happy to stick with tradition, though, I also bought a box of original style pralines from Cafe Beignet (lower right), also in the French Quarter in New Orleans. I thought these were equally as good as Aunt Sally’s, and perhaps a bit less expensive (but I do not remember the exact price). This was my first indication, though, that you could buy pralines almost anywhere and expect good quality from them. The praline on the lower left was from Poché’s in Breaux Bridge, Louisiana, just outside Lafayette. Poché’s is a meat market and grocery store that has tables for those who want to eat on site, and among the grocery items are their own home made pralines. I noticed that no two of them had the same shape, and that some appeared to be larger than others (but actually they were just more flattened out). These were also the traditional variety, and I enjoyed them tremendously. I think perhaps they had more pecans than the others, but I could not swear to this. Unlike the others, these are sold individually. Poché’s is not as big of a tourist mecca as the ones in the French Quarter, but it showed me that pralines are popular throughout the state, and that they are fairly easy to find. I did not try to find pralines in Shreveport, which I also visited, but at least in South Louisiana I think the quest for good pralines is not a difficult one at all.